Each year I teach affixes throughout the year in context. However, we also focus on it during our spelling practice throughout the year. 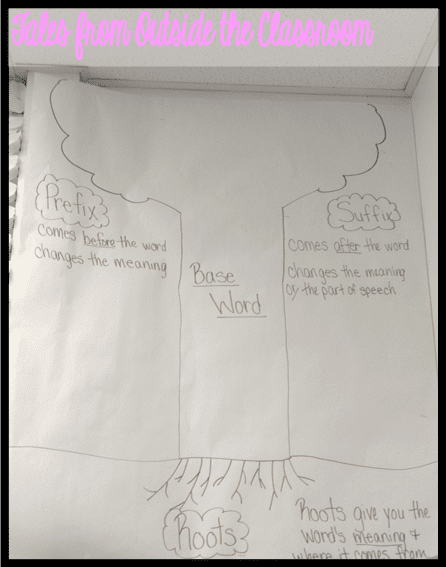 To introduce prefixes, suffixes, and roots, I created this tree and display it as an anchor chart in our classroom above our word wall. Then, as we come across different affixes, we add them to our word wall. This keeps them fresh in students’ minds throughout the year, and also gives us a place in the classroom to refer back. When we write them to add to our word wall we generate other words that use the same word part, which really helps activate students’ schema. I was looking for ideas to help students to continue to explore the affixes we’ve studied. I especially wanted them to be able to work on this independently during our centers. I created these affix wheels using my Ellison SuperStar machine. Click the picture to head over to their site to see more about it.